Sit down with your child and learn about the history of the recorder, then colour in the picture. Learn all about The ukulele, a small, four-stringed instrument from Hawaii. Give your feathered friend a place to rest her wings when you learn how to draw a birdhouse with this step-by-step worksheet! 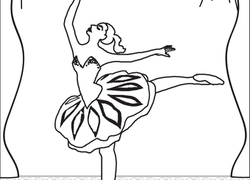 This ballet coloring page features a beautiful ballet dancer performing on stage. Add colour to bring life to this graceful scene. Help your child discover his wild -- and artsy -- side with this drawing project. Did you know trumpets are one of the earliest instruments? Help your little musician colour in the brass trumpet and learn a few more fun facts about it. Have fun learning to draw a cozy bear all wrapped up in a hat and scarf with this step-by-step worksheet.